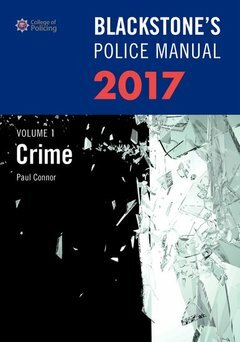 Paul Connor Cert Ed (FE), PG Cert ODE (Open), LLB is a Police Training Consultant, teaching law to over 3000 candidates since 2002. He is the author of the Blackstone's Crime Manual and the Consultant Editor for the Blackstone's Police Manuals. He is the co-author of Blackstone's Police Investigators' Manual, Blackstone's Police Investigators' Workbook and is the author of the Blackstone's Sergeants' and Inspectors' Mock Examination Paper.